The Lee family has been in business serving the New York metropolitan area from its offices on Pell Street since 1888. Lee Insurance is the oldest and most experienced insurance agency in the New York Asian community and now serves its clients in New York and the rest of the nation from three offices across the country. Our headquarters are located in downtown New York, with offices in Northern and Southern California. Lee Insurance's Chinese and English-speaking professionals personally know our clients and use the latest industry information and advanced technology to serve our clients' insurance needs. Sandra K, Lee is the first woman CEO of Harold L. Lee & Sons Inc. Insurance Services, (Lee Insurance ) a family business serving the New York community since 1888. She joined the brokerage in 1981 following a career as a registered nurse . She graduated from the University of Rochester with a Bachelor of Arts in History and Education and the Helene Fuld School of Nursing in New York City. As a licensed insurance broker, life/health agent and real estate broker, Ms Lee oversees the Personal Lines and Group benefits Division of the agency. She has developed a marketing strategy that has grown the agency client base to expand to Southern California and Northern California, with licenses in over 27 states. Lee Insurance now insures thousands of individuals and families as well as a range of commercial clients from small start ups to large businesses, non profits, Asian banks, and public entities and municipalities. She is active in civic and business organizations on local, state and national levels . She is a David Rockefeller Fellow and served the US Small Business Administration under Presidents Clinton and Bush. She has been the recipient of many awards and honors for her leadership in healthcare, insurance and small business issues and speaks frequently on these topics. She has been named by Crain's New York Business as the top 100 most Influential Business Leaders and a year later the Top 100 Minority Business Leaders. Ms. Lee serves on the board of the Chinatown Health Clinic Foundation, New York Chinese Chamber of Commerce, and the Museum of Chinese in America (MOCA). Mr. Boon is a graduate of Long Island University, C.W. Post Campus, where he earned a B.S. degree in Business Administration. After 13 years as a successful executive in the retail and garment industry, Mr. Boon joined Harold L. Lee & Sons, Inc. in 1978. He became a senior account executive specializing in property and casualty for middle market to large accounts, holding licenses as a property and casualty broker and life agent. In 1987, he was promoted to President of the firm and oversees the agency's property and casualty operations and financial institutions programs. Mr. Boon holds leadership positions in several professional insurance associations that have earned him an outstanding reputation in the industry. He has served as the Financial Vice President of the Insurance Federation of New York and was a founder and recent past president of the Chinese American Insurance Association. During his tenure, he initiated a Scholarship Fund for Young Chinese American Insurance Professionals with St. Johns University/College of Insurance. He is an insurance advisor to many non-profit organizations and has managed insurance programs for municipal clients such as the New York City Economic Development Corporation, Senior Citizens HUD Housing Complexes, The Long Island Railroad, Metro-North and the MTA. He has served on several industry producer councils and made presentations to carriers' senior level management on multi-cultural and emerging markets. Lee Kee Lo emigrates from Taishan Village - Guangdong Province, China and opens the Tai Lung (Great Prosperity) Company at 31 Pell Street, New York City. Harold L. Lee, son of Lee Kee Lo, joins the Tai Lung Company, after coming to America in 1905 and studying at The Mount Hermon School in Northfield, MA. Harold Lee begins a foreign exchange business at 31 Pell Street. Tai Lung becomes Chinatown's first agent for American Express. Harold Lee becomes a representative at Manufacturers' Bank, its first Chinese employee, while simultaneously continuing his work at Tai Lung. 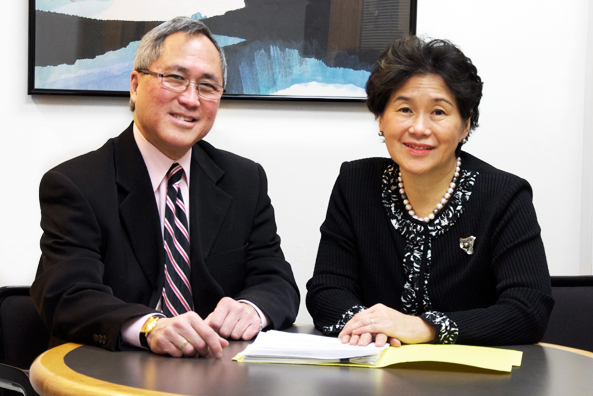 Rose Lee and Andrew P. Lee, Harold's eldest daughter and son, join the firm. Rose works in the foreign exchange business and heads up the bonding service for small businesses. Harold and Andrew introduce the concept of insurance to the Chinatown community. 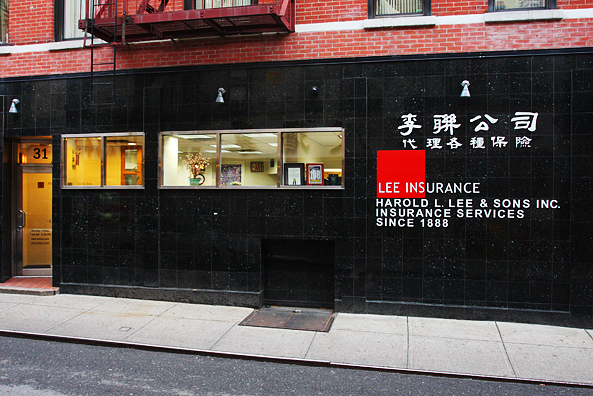 Lee Insurance is Chinatown's first full-service insurance agency. Andrew Lee receives his MBA degree from Columbia University and later serves in the US Army during World War II as a lieutenant in the Central Intelligence Corps. Rose and Catherine Lee run Lee Insurance during Andrew's absence. Andrew Lee achieves and maintains status as member of the esteemed life insurance organization, The Million Dollar Roundtable. Lee Insurance prospers and achieves prominence as a direct agent for Chubb, Hartford, Continental (CNA), and Maryland Casualty (Zurich). Stephen Boon, Jr., son of Rose Lee Boon, joins Lee Insurance. Sandra K. Lee, daughter of Andrew Lee, joins Lee Insurance. Lee Insurance becomes a board member of both the Insurance Federation of New York and the Chinese American Insurance Association. Lee Insurance opens an office in Southern California. Sandra K. Lee is appointed by President Clinton to serve in the U.S. Small Business Administration. NYU - Downtown Hospital names its new $55 million Intensive Care Unit the Andrew P. Lee Critical Care Unit. Crain's NY names Sandra Lee as one of NYC's 100 Most Influential Business Leaders. Lee Insurance is featured in Rough Notes, a leading industry magazine. Sandra Lee named as one of NYC's 100 Most Powerful Minority Business Leaders by Crain's NY. Lee Insurance is profiled in Business Insurance and the National Underwriter magazines.Travelers names Lee Insurance the Agent of the Year—Emerging Markets. Lee Insurance opens an office in Northern California.